We flew to Vancouver from Dallas on Saturday. The ferry trip is a beautiful boat ride between the mainland and Vancouver Island. Before we got on the boat we’d brought fruit and popcorn from a stand in the ferry terminal. We ate the raspberries sitting at a picnic bench with a girl called Lisa who worked on the same stall. The girls adopted her as a new friend and immediately asked her to give them a ballet lesson! She was game and did spend 5 minutes teaching them some ballet positions. What a lovely girl and it reminded me of the friendliness of all the Canadians we’d met on our last trip to British Columbia 9 years ago. We arrived at Crystal Cove last night after a 3 hour drive and had fish and chips for dinner, then a quick explore on the beach. 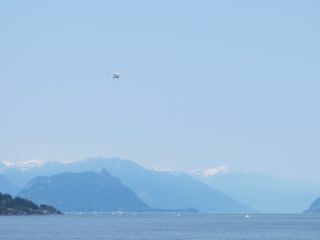 In Vancouver the temperature had been 30c and sunny. 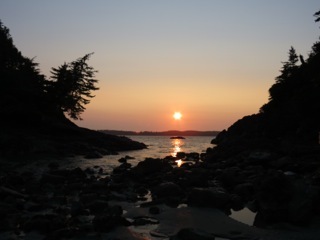 By the time we’d travelled across to Vancouver Island and driven 3 hours North, it was much cooler: 7pm and it was 16c. But that was nice – sunny, but no humidity and not boiling hot. A huge improvement on Houston! 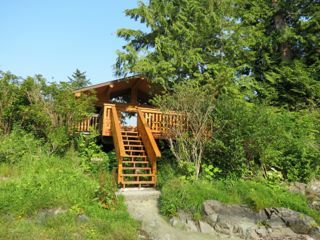 Crystal Cove is a collection of log cabins just outside Tofino. 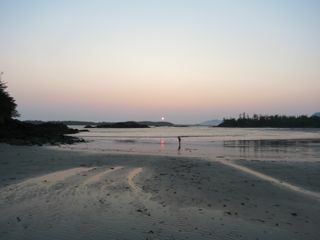 We are right on the beach with an island in front of us that we can walk to when the tide is out. We were up early on Sunday morning and after packing up our stuff (we moved to a new log cabin), went for a proper explore. It was very foggy when we woke up but gradually it cleared to reveal blue skies and warm sunshine. 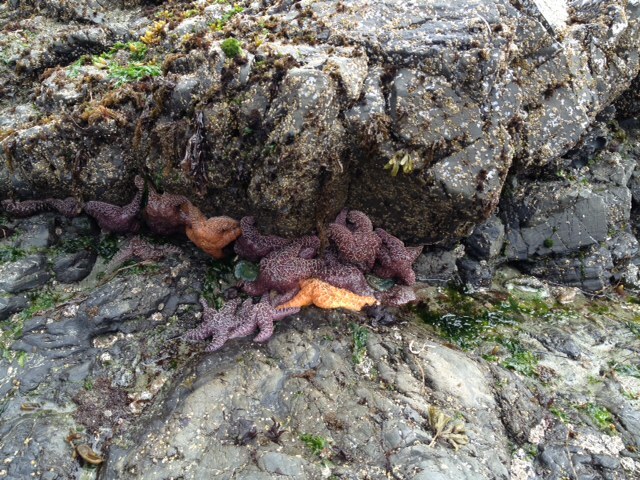 We spent an hour searching rock pools for things and found lots of sealife: star fish (sometimes in piles of 10 or more together), sea anemones, crabs of different sizes and fish that looked just like our catfish in the fish tank at home. 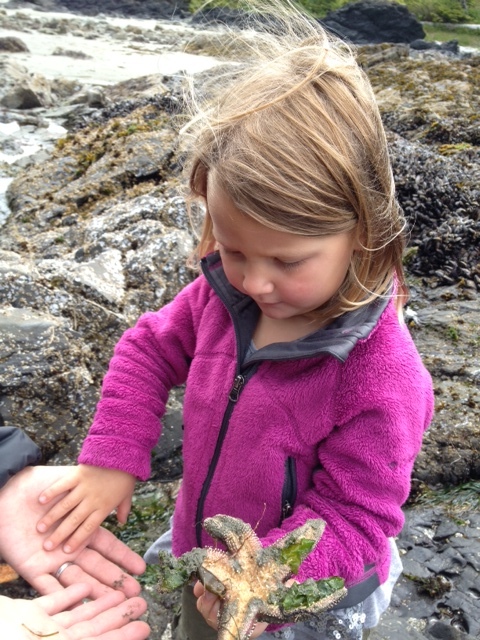 We also found barnacles, whelks and lots and lots of mussels. 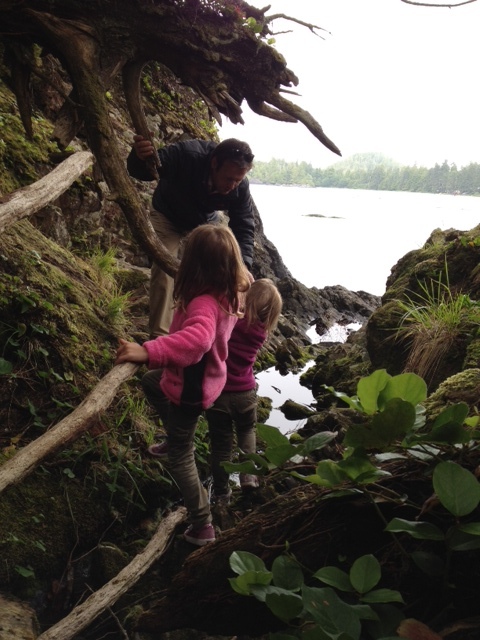 There was a path up on to the island just across from our cabin, so we went for an explore there. There were paths all over the small island, leading underneath tree roots, down into little dens, and up to a high point where someone had installed a swing. There was also the makings of a tree house. What a wonderful place. We scrambled about amongst the trees for an hour or more. After more rock-pooling, we headed off for lunch. We’d been recommended a taco place just across the road from where we were staying and off we went, despite concerns that the girls don’t usually like tacos. The taco bar was a fast food van with a massive queue of people waiting to be served. This was a good sign. We ordered a cheese gringa (like a quesadilla), fish tacos, beef tacos and a vegetarian burrito. The food was delicious and both girls eat lots. We also had a fresh lemon and ginger ice drink and a lime and mint one. Surprisingly the girls even liked these! 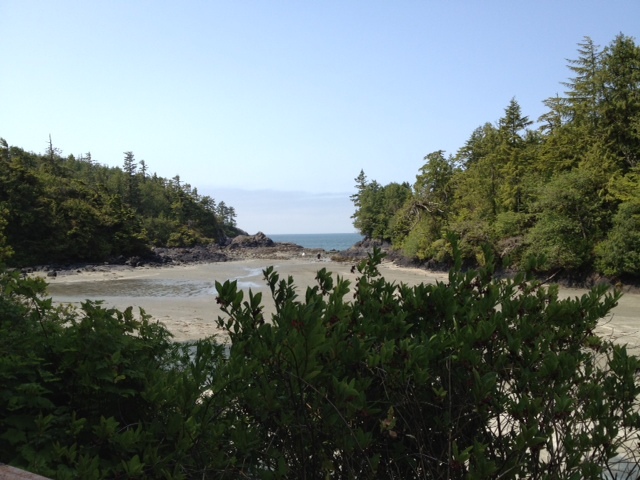 We had a quick drive round Tofino, and stopped for an ice cream before driving past the B&B my Lovely Husband and I had stayed in when we were here 9 years ago. We stopped at the beach opposite which was beautiful – windswept and scattered with washed up trees. Whilst I love the perfect beaches of places like Sardinia, I do prefer a slightly stormy sea with waves. 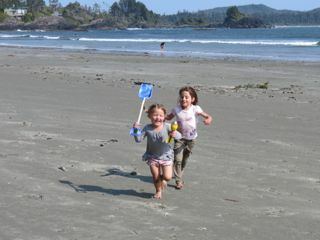 The girls had a very happy couple of hours playing in the sand, building castles, drawing pictures and writing messages. I did have a brief paddle but the temperatures were similar to Cornish beaches in the Summer – a bit too chilly to go in deeper than your ankles! Back to Crystal Cove for more beach exploring and building a fire on the beach to cook our tea: sausages and prawns cooked on the fire. It was quite chilly now as we waited for the food to cook and I read the girls a whole book whilst we waited (Princess Mirror-Belle by Julia Donaldson), wrapped up in lots of clothes and a blanket! This sounds and looks heavenly Kate. What a wonderful place.